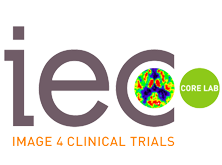 IEC-Core Lab is the first Spanish lab focused on high quality results, image data analysis and reporting for national and international trials. Our constancy, integrity and excellence, together with our extensive knowledge in diagnostic imaging, and adaptability to our customers, has allowed us to thrive as a leading company in this sector. We have partnered with various high-level technological brands who can provide state-of-the-art services. Our goal is to achieve maximum quality throughout the process of acquiring, analyzing and evaluating the images obtained for clinical trials.